Being involved in an auto accident or having your vehicle damaged can be a traumatic and confusing experience. Our 35+ years of expertise and superior customer service can help alleviate much of the stress involved in these instances. Our experts at the all makes and models Stivers Collision Center know how to get you through the collision repair process, and how to repair your vehicle to manufacturer specifications to retain its great look and safety integrity. WE WORK WITH ALL MAJOR AND OTHER SIZED INSURANCE COMPANIES. WE GUARANTEE OUR WORKMANSHIP FOR AS LONG AS YOU OWN YOUR VEHICLE. IN WRITING. WE OFFER AUTO BODY REPAIR, AUTO PAINT, PAINTLESS DENT REPAIR FOR HAIL DAMAGE, BEDLINERS, CUSTOM RESORATIONS AND MUCH MUCH MORE. Wes Conrad is our collision center manager, and he brings a customer-focused attitude to your vehicle repair. Wes has been with Stivers since 2006, and has 20 years of total experience in vehicle collision repair. His approach to the vehicle repair process is the most customer-centric you will find. Always a smile on his face, and an eagerness to make you a happy customer will make you as big of a fan as we are. Anthony Beier is our assistant manager and has the same can-do attitude as Wes. Anthony has been with Stivers since 2009, and is a big part of the need for our new building. He can help you navigate the claim process with all insurance companies. Anthony went to DMACC for auto collision, then started at Stivers in the body shop. He wanted to make a career out of this and moved into the office where he has been estimating for major insurance companies and working with the techs to ensure proper repairs while learning new repair methods each and every day. Renee Allbee is the newest addition to our collision center team, and helped us christen our new building. She brings the same customer focused attitude and smiling face you should expect when getting your damaged vehicle repaired. Renee brings over 15 years of auto body repair experience and customer service to work each day. From small dents and scratches to full body damage repairs and restorations, the collision center here at Stivers Ford Lincoln can fix it. Our body shop team can work on any make or model vehicle to have it looking like new again. Do not trust your collision repairs to just any body shop in the Waukee and Des Moines area; our certified professionals can have it done quickly and accurately. We will work with your insurance company to get your car or truck back on the road as soon as possible. If you were involved in an automobile accident and your vehicle suffered body damage, worry about you and your family, while we worry about your vehicle. We know how stressful an accident can be. That is why our staff will walk you through every step to getting your car or truck back on the road safely. 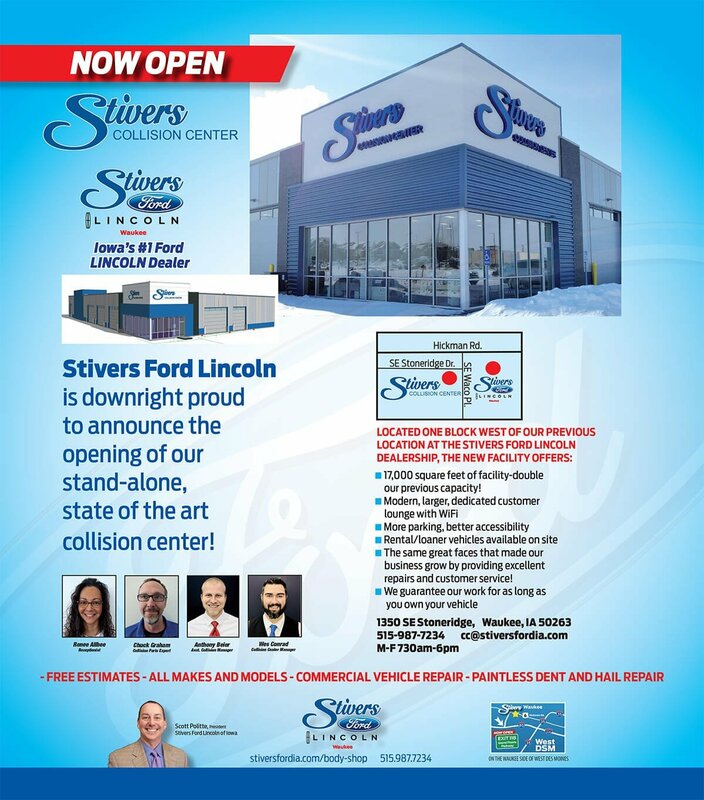 The body shop and collision center here at Stivers Ford Lincoln explains the process from start to finish; this way you know what is going on at all times. We work hard to get your vehicle back to the manufacturer specifications and ensure it is safe for both you and your family to drive again. As one of the premier body shop and collision centers located just outside of Des Moines IA, you can be sure your vehicle will be repaired correctly the first time. Our state-of-the-art collision center allows us to do repairs that other body shops cannot perform. Even if they can, our team can still finish these repairs in a far faster and more accurate manner. Do not trust your collision repairs to just any body shop near Des Moines; call Stivers Ford Lincoln and see why so many residents choose us as their preferred body shop and collision center.